APLA Health’s mission is to achieve health care equity and promote well-being for the LGBT and other underserved communities and people living with and affected by HIV. We are a nonprofit, federally qualified health center serving more than 14,000 people annually. We provide 20 different services from 16 locations throughout Los Angeles County, including: medical, dental, and behavioral health care; PrEP counseling and management; health education; HIV testing and prevention; and STD screening and treatment. For people living with HIV, we offer housing support; benefits counseling; home health care; and the Vance North Necessities of Life Program food pantries. Along with several other critically needed services. We advocate for policy and legislation that positively impacts the LGBT and HIV communities, provide capacity-building assistance to health departments across the country, and conduct community-based research on issues affecting the communities we serve. 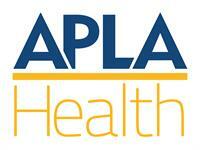 For more information, please visit us at aplahealth.org.